1 A None No Power Seat 1 A is a standard First Class suite. There is a bassinet location here, so passengers traveling with infants are often seated in this row. 1 E None No Power Seat 1 E is a standard First Class suite. 1 J None No Power Seat 1 J is a standard First Class suite. There is a bassinet location here, so passengers traveling with infants are often seated in this row. 10 A None No Power Seat 10 A is a standard Business seat. 10 E None No Power Seat 10 E is a standard Business seat. 10 F None No Power Seat 10 F is a standard Business seat. 10 K None No Power Seat 10 K is a standard Business seat. 11 A None No Power Seat 11 A is a Business seat, however, noise from the more crowded economy cabin may be disruptive. 11 B None No Power Seat 11 B is a Business seat, however, noise from the more crowded economy cabin may be disruptive. 11 D None No Power Seat 11 D is a Business seat, however, noise from the more crowded economy cabin may be disruptive. 11 E None No Power Seat 11 E is a Business seat, however, noise from the more crowded economy cabin may be disruptive. 11 F None No Power Seat 11 F is a Business seat, however, noise from the more crowded economy cabin may be disruptive. 11 J None No Power Seat 11 J is a Business seat, however, noise from the more crowded economy cabin may be disruptive. 11 K None No Power Seat 11 K is a Business seat, however, noise from the more crowded economy cabin may be disruptive. 17 A None No Power Seat 17 A has restricted legroom. The tray table is in the armrest, making the armrest immovable and slightly reducing seat width. There is no floor storage for this seat during take-off and landing. There is a bassinet location here, so passengers traveling with infants are often seated in this row. 17 B None No Power Seat 17 B has restricted legroom. The tray table is in the armrest, making the armrest immovable and slightly reducing seat width. There is no floor storage for this seat during take-off and landing. There is a bassinet location here, so passengers traveling with infants are often seated in this row. 17 C None No Power Seat 17 C has restricted legroom. The tray table is in the armrest, making the armrest immovable and slightly reducing seat width. There is no floor storage for this seat during take-off and landing. There is a bassinet location here, so passengers traveling with infants are often seated in this row. 17 D None No Power Seat 17 D has restricted legroom. The tray table is in the armrest, making the armrest immovable and slightly reducing seat width. There is no floor storage for this seat during take-off and landing. There is a bassinet location here, so passengers traveling with infants are often seated in this row. 17 E None No Power Seat 17 E has restricted legroom. The tray table is in the armrest, making the armrest immovable and slightly reducing seat width. There is no floor storage for this seat during take-off and landing. There is a bassinet location here, so passengers traveling with infants are often seated in this row. 17 F None No Power Seat 17 F has restricted legroom. The tray table is in the armrest, making the armrest immovable and slightly reducing seat width. There is no floor storage for this seat during take-off and landing. There is a bassinet location here, so passengers traveling with infants are often seated in this row. 17 G None No Power Seat 17 G has restricted legroom. The tray table is in the armrest, making the armrest immovable and slightly reducing seat width. There is no floor storage for this seat during take-off and landing. There is a bassinet location here, so passengers traveling with infants are often seated in this row. 17 H None No Power Seat 17 H has restricted legroom. The tray table is in the armrest, making the armrest immovable and slightly reducing seat width. There is no floor storage for this seat during take-off and landing. There is a bassinet location here, so passengers traveling with infants are often seated in this row. 17 J None No Power Seat 17 J has restricted legroom. The tray table is in the armrest, making the armrest immovable and slightly reducing seat width. There is no floor storage for this seat during take-off and landing. There is a bassinet location here, so passengers traveling with infants are often seated in this row. 17 K None No Power Seat 17 K has restricted legroom. The tray table is in the armrest, making the armrest immovable and slightly reducing seat width. There is no floor storage for this seat during take-off and landing. There is a bassinet location here, so passengers traveling with infants are often seated in this row. 18 A None No Power Seat 18 A is an Economy seat, however, there is no window at this row. 18 K None No Power Seat 18 K is an Economy seat, however, there is no window at this row. 2 J None No Power Seat 2 J is a standard First Class suite. 25 A None No Power Seat 25 A may have limited recline. The proximity to the lavatory and galley may be bothersome. 25 B None No Power Seat 25 B may have limited recline. The proximity to the lavatory and galley may be bothersome. 25 C None No Power Seat 25 C may have limited recline. The proximity to the lavatory and galley may be bothersome. 25 D None No Power Seat 25 D may have limited recline. The proximity to the lavatory and galley may be bothersome. 25 E None No Power Seat 25 E may have limited recline. The proximity to the lavatory and galley may be bothersome. 25 F None No Power Seat 25 F may have limited recline. The proximity to the lavatory and galley may be bothersome. 25 G None No Power Seat 25 G may have limited recline. The proximity to the lavatory and galley may be bothersome. 25 H None No Power Seat 25 H may have limited recline. The proximity to the lavatory and galley may be bothersome. 25 J None No Power Seat 25 J may have limited recline. The proximity to the lavatory and galley may be bothersome. 25 K None No Power Seat 25 K may have limited recline. The proximity to the lavatory and galley may be bothersome. 26 A None No Power Seat 26 A has extra legroom. The proximity to the lavatory and galley may be bothersome. The tray table is in the armrest, making the armrest immovable and slightly reducing seat width. There is no floor storage for this seat during take-off and landing. 26 B None No Power Seat 26 B has extra legroom. The proximity to the lavatory and galley may be bothersome. The tray table is in the armrest, making the armrest immovable and slightly reducing seat width. There is no floor storage for this seat during take-off and landing. 26 C None No Power Seat 26 C has extra legroom. The proximity to the lavatory and galley may be bothersome. The tray table is in the armrest, making the armrest immovable and slightly reducing seat width. There is no floor storage for this seat during take-off and landing. 26 D None No Power Seat 26 D has extra legroom. The proximity to the lavatory and galley may be bothersome. The tray table is in the armrest, making the armrest immovable and slightly reducing seat width. There is no floor storage for this seat during take-off and landing. There is a bassinet location here, so passengers traveling with infants are often seated in this row. 26 E None No Power Seat 26 E has extra legroom. The proximity to the lavatory and galley may be bothersome. The tray table is in the armrest, making the armrest immovable and slightly reducing seat width. There is no floor storage for this seat during take-off and landing. There is a bassinet location here, so passengers traveling with infants are often seated in this row. 26 F None No Power Seat 26 F has extra legroom. The proximity to the lavatory and galley may be bothersome. The tray table is in the armrest, making the armrest immovable and slightly reducing seat width. There is no floor storage for this seat during take-off and landing. There is a bassinet location here, so passengers traveling with infants are often seated in this row. 26 G None No Power Seat 26 G has extra legroom. The proximity to the lavatory and galley may be bothersome. The tray table is in the armrest, making the armrest immovable and slightly reducing seat width. There is no floor storage for this seat during take-off and landing. There is a bassinet location here, so passengers traveling with infants are often seated in this row. 26 H None No Power Seat 26 H has extra legroom. The proximity to the lavatory and galley may be bothersome. The tray table is in the armrest, making the armrest immovable and slightly reducing seat width. There is no floor storage for this seat during take-off and landing. 26 J None No Power Seat 26 J has extra legroom. The proximity to the lavatory and galley may be bothersome. The tray table is in the armrest, making the armrest immovable and slightly reducing seat width. There is no floor storage for this seat during take-off and landing. 26 K None No Power Seat 26 K has extra legroom. The proximity to the lavatory and galley may be bothersome. The tray table is in the armrest, making the armrest immovable and slightly reducing seat width. there is no floor storage for this seat during take-off and landing. 34 C None No Power Seat 34 C is a standard Economy seat, however, other flyers tend to bump into this seat. 34 H None No Power Seat 34 H is a standard Economy seat, however, other flyers tend to bump into this seat. 35 A None No Power Seat 35 A is an Economy seat. As this row is not aligned with the row in front, the seat anchors from the row in front may be bothersome. The window side may have extra room, although some passengers find it more difficult to sleep without having a wall to lean against. 35 B None No Power Seat 35 B is an Economy seat. As this row is not aligned with the row in front, the seat anchors from the row in front may be bothersome. 35 J None No Power Seat 35 J is an Economy seat. As this row is not aligned with the row in front, the seat anchors from the row in front may be bothersome. 35 K None No Power Seat 35 K is an Economy seat. As this row is not aligned with the row in front, the seat anchors from the row in front may be bothersome. The window side may have extra room, although some passengers find it more difficult to sleep without having a wall to lean against. 36 A None No Power Seat 36 A is a standard Economy seat. This seat has extra room along the window, although some passengers find it more difficult to sleep without having the wall to lean against. 36 K None No Power Seat 36 K is a standard Economy seat. This seat has extra room along the window, although some passengers find it more difficult to sleep without having the wall to lean against. 37 A None No Power Seat 37 A has limited recline. The proximity to the lavatory and galley may be bothersome. This seat has extra room along the window, although some passengers find it more difficult to sleep without having the wall to lean against. 37 B None No Power Seat 37 B has limited recline. The proximity to the lavatory and galley may be bothersome. 37 K None No Power Seat 37 K is a standard Economy seat. This seat has extra room along the window, although some passengers find it more difficult to sleep without having the wall to lean against. 38 D None No Power Seat 38 D is a standard Economy seat, however, the proximity to the lavatory and galley may be bothersome. 38 G None No Power Seat 38 G is a standard Economy seat, however, the proximity to the lavatory and galley may be bothersome. 38 K None No Power Seat 38 K is a standard Economy seat. This seat has extra room along the window, although some passengers find it more difficult to sleep without having the wall to lean against. 39 G None No Power Seat 39 G has limited recline. The proximity to the lavatory and galley may be bothersome. 39 J None No Power Seat 39 J has limited recline. The proximity to the lavatory and galley may be bothersome. 39 K None No Power Seat 39 K has limited recline. The proximity to the lavatory and galley may be bothersome. This seat has extra room along the window, although some passengers find it more difficult to sleep without having the wall to lean against. 6 D None No Power Seat 6 D is a standard Business seat. There is a bassinet location here, so passengers traveling with infants are often seated in this row. 6 E None No Power Seat 6 E is a standard Business seat. There is a bassinet location here, so passengers traveling with infants are often seated in this row. 6 F None No Power Seat 6 F is a standard Business seat. There is a bassinet location here, so passengers traveling with infants are often seated in this row. 7 A None No Power Seat 7 A is a Business seat, however, the proximity to the lavatory and galley may be bothersome. This seat has a misaligned window. 7 B None No Power Seat 7 B is a Business seat, however, the proximity to the lavatory and galley may be bothersome. 7 D None No Power Seat 7 D is a Business seat, however, the proximity to the lavatory and galley may be bothersome. 7 E None No Power Seat 7 E is a Business seat, however, the proximity to the lavatory and galley may be bothersome. 7 F None No Power Seat 7 F is a Business seat, however, the proximity to the lavatory and galley may be bothersome. 7 J None No Power Seat 7 J is a Business seat, however, the proximity to the lavatory and galley may be bothersome. 7 K None No Power Seat 7 K is a Business seat, however, the proximity to the lavatory and galley may be bothersome. This seat has a misaligned window. 8 A None No Power Seat 8 A has extra legroom. The proximity to the lavatory and galley may be bothersome. 8 B None No Power Seat 8 B has extra legroom. The proximity to the lavatory and galley may be bothersome. 8 D None No Power Seat 8 D has extra legroom. The proximity to the lavatory and galley may be bothersome. There is a bassinet location here, so passengers traveling with infants are often seated in this row. 8 E None No Power Seat 8 E has extra legroom. The proximity to the lavatory and galley may be bothersome. There is a bassinet location here, so passengers traveling with infants are often seated in this row. 8 F None No Power Seat 8 F has extra legroom. The proximity to the lavatory and galley may be bothersome. There is a bassinet location here, so passengers traveling with infants are often seated in this row. 8 J None No Power Seat 8 J has extra legroom. The proximity to the lavatory and galley may be bothersome. 8 K None No Power Seat 8 K has extra legroom. The proximity to the lavatory and galley may be bothersome. 9 B None No Power Seat 9 B is a standard Business seat. 9 D None No Power Seat 9 D is a standard Business seat. 9 J None No Power Seat 9 J is a standard Business seat. With audio onDemand and the new ICE entertainment system, you can choose from thousands of audio programs and music tracks. With personal televisions at every seat and the new ICE entertainment system, you have video onDemand, 1,000 channels, and video games. Every first and business class seat has a regular 110v AC power port. Each cluster of economy seats has two power ports. In addition, every seat has a USB port and every other seat has an Ethernet port. The USB port allows you to display your PDA or MP3 player information on the personal TV screen. Emirates offers multi-cultural cuisine on all their flights. Emirates operates the 777-200 aircraft in three different configurations. This version designated as the 777-200LR operates in a three class layout and reflects the newest configuration and retrofit of this aircraft type. To verify the correct version of this aircraft at the time of booking or at online check-in, the following rows may be used as reference: First Class are rows 1-2; Business Class are rows 6-11 and Economy begins row 17 with 216 seats. Click here for Emirate's online tool to identify operating aircraft type by flight or route. In this newest version of the 777-200, all classes feature Emirates ICE inflight entertainment system. 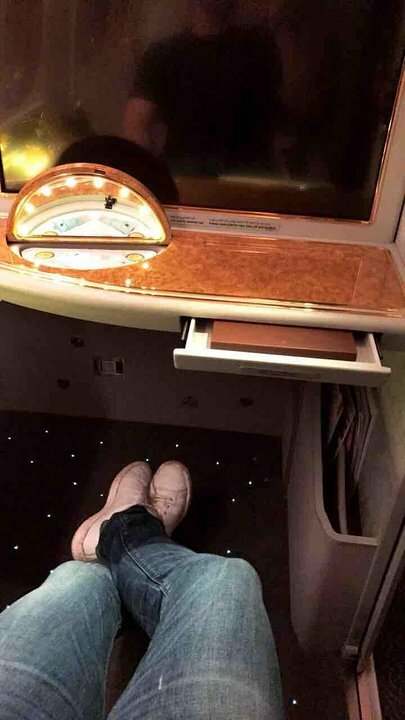 First Class are Emirates close door suites and Business Class are angled lie-flat seats. cramped knee room for me at 1.7m tall. video boxes under seats are a nuisance. rotten aircraft after being in the A380. The arm rest between the seats would not lift up so could not stretch out over the empty seat next to me. Rather irritating on a 14 hour flight. Second of 3 double seats at rear of aircraft. One of first to board after Premium. Seat offers a bit more space as no 'C' seat. Cabin a little tired. Seat quite hard. Good selection of entertainment with ICE but could hardly hear output with provided headphones. Toilets got busy. would choose again. Food very poor.Personnel very polite.Seat convenient but noisy. Flight between AKL-DXB. Was the third time i took this flight over the last 2 months. My body type is 185 cm, 95 Kgs, athletic. Here are my feedbacks: Was lucky to change to an exit row from 29G to 26C. Despite the commentary that the proximity of the lavatory and galley may be a bothersome, the small amount of bothersome of the location versus the space for my legs for a 17h flight, which is entirely over night, was a really easy decision. I slept about 11h on this flight thanks to sleeping pill and was legs were not cramped when i woke up. So if you can get an exit row: DO IT. The Boing 777 is la oud plane, so nothing Emirates can really do. Try to seat in front of the engine if you can. But noise cancelling headphones are highly welcomed. The exit row seats are narrower than regular ones, so there is a bit more compression from the sides. The TV cannot be used during Taxi, Take off and Landing (time to read or chat with the cabin crew). An exit row seat on the aisle can be annoying as people hit the tv often. 90% of the time they apologise but it can be annoying. I highly recommend to get food at the airport. I was surprised the first time, but there not much food provided during the 17h flight. And this was the case for previous flights I had taken. There is pretty much no storage for you cabin luggage. If you don't need your cabin luggage during the flight, put it above the rows in front of you. The crew usually puts it above the rows behind you, but when you are arrived everyone wants to get out and you trying to access your carry-on that is sitting 2-3 rows behind is like being a salmon swimming against the river. Overall: The company is great (I am Gold member), the flight is long, so yes the body is not going like it. But sleeping pills, noise cancelling headphones, good hydration will make it work. I flight back in a week this time with the A380 doing this long-haul. Looking forward to feel the difference. Very poor. A pity no respect for passengers especially on long haul flights such as Dubai to Auckland NZ. Over time seat size reduced,narrowed aisles. Just a thought for the airline....more older people travelling, yet need to be almost a contortionist to get in and out of seats....will this impinge on profits? Main bulk of profits from economy passengers yet 'profits before people' even with low price of oil. Aptly named "cattle class". Very poor cabin service on Emirates. Poor food, stale bread....cold coffee. All that used to make up service now pared down. What are cabin crew doing on such a long flight....yet I don't blame them it is the management that calls the shots... what they think they can get away with. NZ at the end of the line so dump a low grade plane and service on them as no choice. Travelled in past on Airbus A380 but can only get this plane if fly to Sydney. Bad news. Never again. Good seat in a pair with plenty of room due to widened aisle and on the opposite side to the toilet. The noise in the back of the plane is compensated by the fact that (i) you have one of the few pair seats, perfect if you travel with a partner, (ii) the aisle widens so that you have a less cramped feeling than in the 10-abrest area, and (iii) you have relatively more space in the overhead compartment. This is the sad reality for a large airline that has to retain it's older aircraft. This business class seat may have been good in it's day, but is sub standard now. There is no place to adequately rest both your arms, the seats lack comfort in the upright position, but is better when reclined, but has only limited control over each position. The a380 is a much nicer seat, but sadly this 777 aircraft is used extensively on long haul connections. This was a good seat but insufficient for the 13 hour journey from BOS to DXB. The seat was not cushioned enough and legroom was insufficient (for reference, I'm 5'7"). To make matters worse, when you recline, the seat slides forward, further restricting your legroom. I would fly EK again but only for the ICE. The 10 seats across configuation in the Emeriates 777s make the the corridors very tight causing many passengers to bump into you when sitting in an aisle seat. Seat 27C is even more prone to this as the gallery which is situated one seat further along sticks out into the corridor space makeing the room to pass even more restricted. Given the close vicinity of the toilets this section of the plane endures very high passenger traffic. Emirates flies 1 versions of Boeing 777-200LR .